For anyone out there afraid that Dancing with the Stars was in danger after the show was left off of ABC’s spring schedule, don’t be. At the moment, it is clear that some strange stuff is happening within the Dancing with the Stars world — after all, there is no word on a season 28! 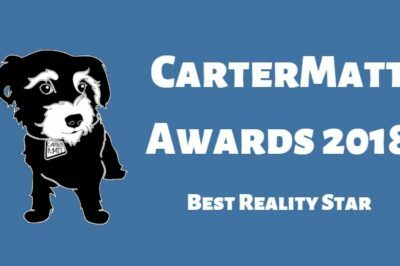 Check out the field for Best Reality Star at the 2018 CarterMatt Awards, and then be sure to vote for your own favorite! Dancing with the Stars 28 is not going to be airing on ABC this spring — what happens next with the ballroom show? Dancing with the Stars 27 finale: Did Bobby Bones or Evanna Lynch win? Who won Dancing with the Stars 27: Evanna Lynch, Milo Manheim, or someone else? We discuss! Dancing with the Stars season 28 renewal odds: Will it be back? Will there be a Dancing with the Stars season 28 on ABC? This seems to be a reasonable thing to bank on at the moment. Dancing with the Stars 27 results: Was Grocery Store Joe eliminated? Tonight, Dancing with the Stars 27 delivered yet another elimination … and this could’ve been the one to change things. Tonight, Dancing with the Stars 27 offered up its first Double Elimination of the season; with that in mind, there was a chance for a BIG surprise. Entering tonight’s Dancing with the Stars 27 episode, one thing was clear: Grocery Store Joe was in trouble. Going into tonight’s Dancing with the Stars elimination, it felt pretty darn clear that tonight was Grocery Store Joe’s night.